We are glad to share the news that iFreeTools will soon be supporting internationalization and localization. Once available, you will be able to select the language in the App Settings and the application will be rendered using the selected language. 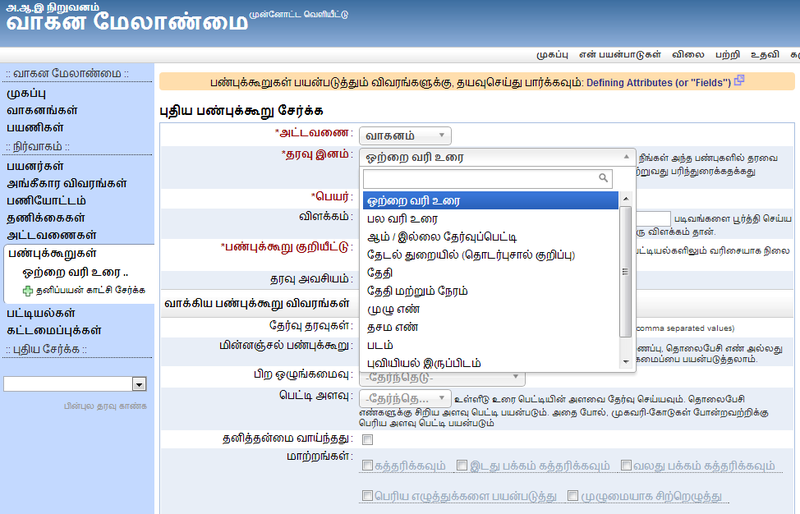 For the first cut, we are enabling support for Tamil, a south-Indian language, which we have been using in our testing. 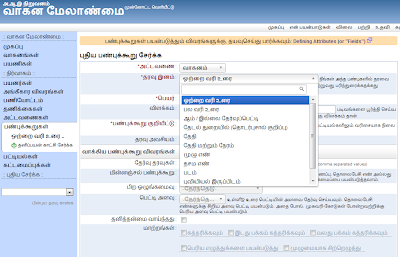 The image below shows the Add Attribute form in Tamil. You will be able to try the Tamil language in our Labs set up currently and the changes which will make it into the other deployments very soon. Help translate iFreeTools and get a $90 discount* on your single-tenant deployment! If your language is not already supported in iFreeTools Creator and if you are interested in helping us support the same, feel free to get in touch with us for the language mapping file. Once the translation is completed and imported into your single-tenant deployment, you should be able to have the application in your language. Our effort to support multiple-languages was triggered by Ms.Belén Lara's detailed blog post on iFreeTools Creator, which is equivalent to a quick-start guide in Spanish : ...crear una Base de Datos on-line. iFreeTools. After we added support for multiple languages, she has also provided the Spanish translation for the application. Coming from a technologically savvy database user, we believe her translations should work out well for the Spanish users of our application. We have rolled-in Italian language support in iFreeTools Creator, thanks to the efforts of Mr.Adriano Caresani. If you are looking to build your online database application and would like hire an Italian-speaking consultant, you should get in touch with Adriano. The compensation for the translation mapping file, which will become a property of iFreeTools, will be provided in the form of discount to subscription fees alone. This discount is applicable for one paid, single-tenant deployment and towards the first year subscription fee alone. Even if the language mapping is already available with us, translation to popular country-specific dialects may still be eligible for a $45 discount. The terms and conditions of this offer can be refined / altered / the offer itself might be withdrawn at any time. You are requested to kindly get in touch with us using the feedback form, to know if you can avail this offer.